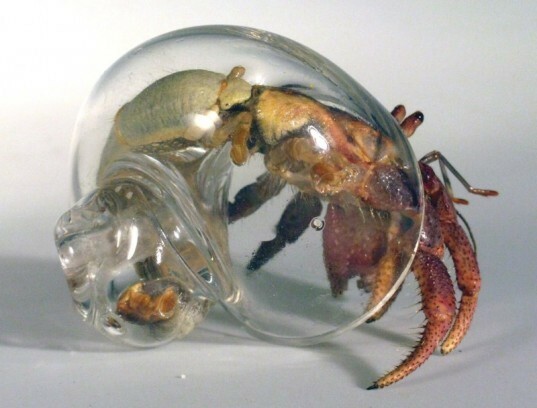 Glass blower Robert DuGrenier has been blowing glass for over 30 years, but for the last 15 he has been creating hand-blown glass terrarium sculptures to house living art compositions for about 50 hermit crabs (or “Crabitats,” as we’ve taken to calling them). Now, DuGrenier is offering his glass shells up for sale, so if you are a hermit crab lover then this is for you! DuGrenier takes extreme care in making the glass shells. As he initiatee the exact interior shape of nature’s shell in each of his hand blown replicas, they pose no harm to the crabs due to the spiral formations which accommodate the contours of their bodies. He has, of course, added his own artistic flourish by fusing the crystal with 24 karat gold, sterling silver or bronze. Like in nature, hermit crabs inhabit the glass shell until they outgrow it. That’s why DuGrenier’s creations come in a variety of sizes to fit crabs of different ages. “We make shells in clear glass, colored glass, and glass coated with precious metals. Glass shells come in all sizes; since they are hand blown, no two are the same,” said DuGrenier of his creations. If you’re interested in buying one, click here to browse DuGrenier’s site. Check out the below video of the crabitats in action! 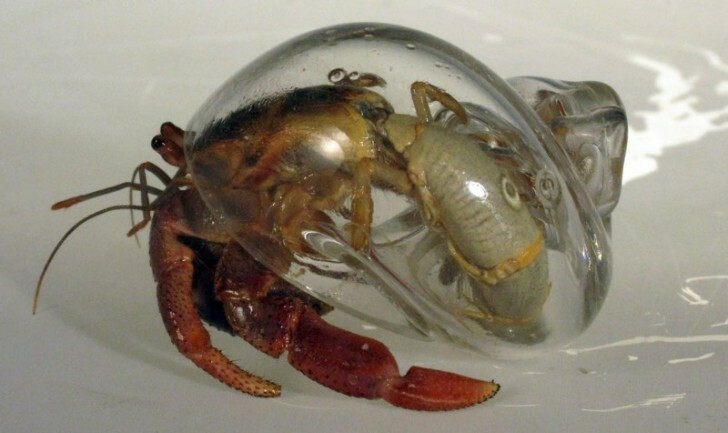 Glass blower Robert DuGrenier has been blowing glass for over 30 years, but for the last 15 he has been creating hand-blown glass terrarium sculptures to house living art compositions for about 50 hermit crabs (or "Crabitats," as we've taken to calling them). Now, DuGrenier is offering his glass shells up for sale, so if you are a hermit crab lover then this is for you!